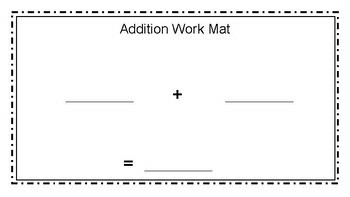 This is designed to be used with manipulatives to give practice with basic addition. It can be laminated or placed inside a dry erase mat to be reusable and durable. The students place the counters in the first two lines for the two addends. They pull the counters down to the equal sign to total the sum. Can also be used with base 10 blocks for double digit addition.